...that the Spider owns the Tangled Shore? "PASSION AND PARADOX. \ AID THE VISION. \ SIMPLICITY REQUIRES COMPLEXITY. \ RESENT THE JOKE. \ GLIMPSE THE CHASM." 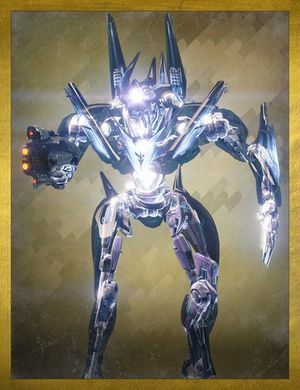 Atheon, Time's Conflux is a massive Vex Minotaur and the Axis Mind that overseers the Vault of Glass on Venus. As the Mind in charge of bridging the Vex's own calculations into existence, it is difficult to decipher what Atheon is exactly; whether it is the creator of the Vault or its creation. What is clear is that Atheon has complete ontological control over time within the Vault and converges multiple pathways from every axis in the space-time bulk, able to send Guardians into the distant past or future at will. It is the centerpiece of the Vex Conflux network, which extends the Nexus network across space and time, as part of their plans to incorporating the Vex into reality itself. Its eye was later retrieved after the battle and delivered to the Future War Cult for analysis. Atheon's encounter is the most difficult in the Vault of Glass. It is split up into 2 parts and requires multi-tasking, focus, and awareness. In order to start killing Atheon, it must first be lured out by awakening the Glass Throne. To start this process, the player should kill all enemies in sight, including a Gatekeeper, a Vex Hydra which lacks a shield, but compensates with its ability to teleport. Killing this Gatekeeper will begin the encounter. There will be 2 Vex Transfer Gates that must be opened by capturing their respective Sync Plates. Additional Vex will pour out of these gates when they open. Two people should stand on one plate and guard it. However, this will cause more Vex to spawn, including Praetorians, which should be the top priority target during this part as they have the ability to capture Sync Plates as well, giving control of them back to the Vex. If one ever gets captured, an Oracle will spawn above the gate. Failure to destroy it will cause the team to wipe. Maintaining control of these plates will open up a gate. The remaining team members will enter the gate and proceed to kill all enemies inside. There will be another Gatekeeper waiting at the end of the area. Killing it will drop the Aegis, but all players in the gate will then be marked by the Void. This can be counterracted by having the Aegis holder use the cleanse function of the relic. Failure to cleanse results in death. This debuff will keep being applied until everyone has exited the gate. A Conflux will then spawn in the middle of the arena, after which a group of Minotaurs will spawn and try to sacrifice themselves to it. Failure to defend it results in the entire team being expunged. After the conflux has been defended, the people who guarded the first plate should now go for the second plate and maintain a firm hold on it to unlock the next gate. As soon as the remaining Guardians enter it, they will be marked by the Void again. The relic holder must keep cleansing everyone to keep this debuff off. There will be one more Gatekeeper to kill, which will drop another Aegis for someone else to pick up. After both relics have been claimed, all Guardians must defend the central conflux from more Vex until the Glass Throne awakens. With the throne open, Atheon will spawn and face the Guardians personally. It will walk forward and fire his Torch Hammer at all players in sight. Shortly after, he will open the Timestream and teleport 3 team members at random into either the distant future or past. Those teleported will again be marked by the Void and must be cleansed. Focus should be placed on killing all the enemies inside and destroying all the Oracles being summoned by Atheon. Failure to do so will result in Atheon immediately killing the inside team using the Prophecy of Doom. Destroying all the Oracles will result in a safe exit. Meanwhile, those on the outside with Atheon will be detained. Players must shoot their way out of these bubbles like how they did when facing the Templar. In addition, Supplicants, which are Harpies that act as kamikaze units, will flood the arena and move very erratically towards the player. If they get too close, it can result in serious damage being taken or an immediate death. These Supplicants will spawn until the inside team makes it back out, at which point the Aegis holder will have attained a buff called Time's Vengeance, which greatly boosts all damage to Atheon. This is where the damage phase begins. The buff lasts 30 seconds. Once the buff expires, the process resets. Note that the lower Atheon's health, the faster the fire rate and the bigger the blast radius of its Torch Hammer becomes. Repeating the process enough times will eventually result in Atheon's death. Age Of Triumph introduced a challenge mode for Atheon, in which every member of the fireteam must kill 1 oracle in each phase. If someone kills more than one oracle, the challenge will not be registered. This means that the players holding the portal open must enter the portal one at the time and kill one of the oracles. The name Atheon is derived from Atheos, which roughly means "atheist". This appears to be in conflict with the Vex's apparently religious nature. An alternative hypothesis argues that the name of Atheon is actually a combination of the latin word Atheos, in addition to the word Eon, which measures the duration of 1,000,000,000 years. When paired together, this then creates the name of Atheon, in effect, translating as either that which does not believe in time, or that which is capable of removing itself from time altogether. In Year 1 of Destiny, there was a particularly famous exploit in the Vault of Glass where the team facing Atheon could push him off the edge of the platform where he was standing. Doing this effectively meant the team doing the raid would complete the encounter and receive full rewards. Atheon and Protheon, Modular Mind share many similarities. Atheon is the first Vex boss to be called by name when it was during Destiny's Age of Triumph. Atheon is the first raid boss in Destiny's history, as well as being the first to have two phases. The other raid encounters with two phases include Aksis, Archon Prime and Argos, Planetary Core. Atheon standing at his Glass Throne.